This item is a FREE PDF download. You will need to fill in your billing and shipping info at checkout just as if you were ordering books. If the items ordered are all FREE, the Payment Type box will say "No Charge." Click on the Preview Order button, and at the bottom of the Preview page, click on the Place Order button. Your downloads will be immediately available, first by a flash-screen, and also as an email. The Map Guide to Swiss Parish Registers series of approximately 15 volumes, by Kevan M. Hansen, is available on a standing order basis. This is a flyer describing and allowing purchase of these books, both individually, or on a standing order basis. Those with standing orders for the Map Guide to Swiss Parish Registers series currently receive a 15% discount off the regular price of these volumes. Standing order discounts are given with the proviso that all volumes currently in print are either being ordered on the date whereon the standing order is placed, or that the ordering party already has purchased the previously published volumes. Based upon our experience thus far, we expect the production of this project to run through late 2018, approximately one volume every 6 weeks coming into print. 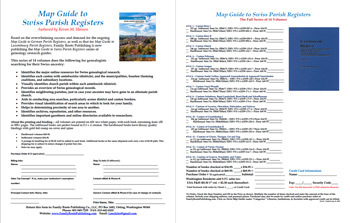 Order this FREE item to get full information on the Map Guide to Swiss Parish Registers series.